The United States Food and Drug Administration gave its approval on Wednesday to a new gene therapy for a specific form of lymphoma, which Kite Pharma a subsidiary of Gilead Science developed, marking the regulator’s second approval of this revolutionary approach to fighting cancer. The FDA gave its approval to gene therapy Yescarta, which is for treating adults that have large B-cell lymphoma, a form of non-Hodgkin lymphoma, and who have not responded to previous treatments. Gilead, which just recently took over Kit Pharma, said the Yescarta list price is $373,000. The treatment is administered only once to each cancer patient. The price is far below the first drug from this new class. That drug, Kymriah, developed by Novartis, sells for $475,000. The gene therapy by Novarits was approved this past August to treat B-cell acute lymphoblastic leukemia. The form of leukemia is the most common found in children in the U.S. Both the new therapies are known as CAR-Ts or chimeric antigen receptor T-cell, which reprograms the immune cells in the body to recognized then attack all malignant cells. The high cost of CAR-Ts has ignited much debate over the rising costs of today’s prescription medications. Novartis said that it would only charge for Kymriah if patients responded to it within a month of being treated, but Gilead has not followed suit. A spokesperson for Gilead, has said the pharmaceutical was in active and ongoing talks with payers and has communicated an openness to considering various solutions that improve access by patients. The spokesperson added that the price was made following much research with government agencies that reimburse costs for drugs as well as with private insurers and centers for cancer. 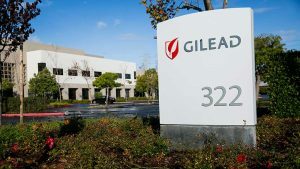 After the approval was announced, Gilead shares increased close to 4% in trading after the bell. One analyst said that Yescarta could potentially generate sales of more than $250 million during 2018. Gilead said close to 7,500 patients with lymphoma in the U.S. would be eligible each year for the new gene therapy, approved on Wednesday. The American Cancer Society has estimated that over 72,200 people in 2017 will be given a diagnosis of non-Hodgkin lymphoma and that more than 20,130 will die from the cancer. This form of lymphoma represents close to 4% of all cancer across the U.S. Potentially curative CAR-T gene therapies are on the forefront of revolutionizing treatment of blood cancer, offering therapies that are tailored to each individual patient.